This cynical theory is popular but wrong. “Chinese Discourses on Happiness” is a timely new collection of essays edited by two sinologists based in Britain, Gerda Wielander and Derek Hird. It explores how China’s propaganda machine devotes extraordinary efforts to promoting the idea that the Chinese people enjoy good and meaningful lives under Communism—precisely because economic growth alone does a poor job of generating happiness. Back in 1974 Richard Easterlin, an American economist, spotted a puzzle. Although richer countries are generally more contented, rising material prosperity does not necessarily lead to ever-higher levels of self-reported well-being. “Chinese Discourses” calls China a giant Easterlin Paradox. Chinese real GDP per person grew more than fivefold between 1990 and 2015. Yet, rather than climbing in lockstep with the economy, the self-reported happiness of the Chinese fell sharply from 1990, reaching a nadir in 2000-05 (a time of breakneck GDP growth) before recovering. It has probably yet to regain the level of 1990. A chapter of the 2017 World Happiness Report, co-written by Mr Easterlin, dug into Chinese data from the previous quarter-century and found weak correlations between happiness and several trends commonly blamed for gloom. Take inequality of income, which in China marched upwards between 1980 and about 2010. During the same period levels of self-reported happiness fell and rose in a U-shape. The chapter studies other “predictors” of happiness, including the consumption of coal (a proxy for pollution), housing prices, GDP per person, healthy-life expectancy, self-reported levels of freedom to make big decisions and corruption (measured by asking whether bribery is acceptable). None of these indicators tracks happiness closely in China. Two others are a good fit: unemployment and access to social safety nets. Misery, notably among low-income Chinese, deepened as unemployment spiked and safety nets collapsed in 2000-05, as state-owned firms were restructured. As employment rebounded, so did happiness. Even people normally considered clear beneficiaries of China’s economic opening—the hundreds of millions of rural migrants who found work in cities over the past 30 years—are not collectively cheerier. The most recent World Happiness Report, from 2018, finds that, on average, Chinese migrants secure higher incomes by moving to cities but, once there, say they are less happy than long-established city folk. More surprisingly, such migrants are also unhappier than cousins who stayed in the countryside. Dig into the numbers, and the jobs of the unhappiest migrants are unusually insecure, harsh and badly paid, thrusting them into an underclass made more painful by hukou residency laws that limit their access to schooling for their children and other public services. Rising prosperity cannot compensate for a sense of being left out. “Chinese Discourses” suggests that party chiefs have long worried about such risks. In the 1950s they pledged to build a “prosperous and happy socialist society”. Today, in the Xi era, a similar message is rammed home in television shows, posters and websites lauding model citizens who find joy in serving the country. Some propaganda is plain sneaky. A contributor to the new book, Jigme Yeshe Lama of the University of Calcutta, notes that state media declared the tense, heavily policed Tibetan capital, Lhasa, “China’s happiest city” for six years in a row. That improbable feat was achieved by deeming government policies, from imposing tight security to building highways or pushing Tibetans into modern jobs, to be the definition of happiness. Other propaganda is more subtle. Party homilies about collective happiness, common in the 1950s, have been replaced by stories about well-being on two levels: the personal and the national. Individuals are told that they are xingfu, or “happy and blessed”, because Chinese families are made strong by traditional values. In turn, Mr Xi likes to say, families are made secure and prosperous by loyal membership of “the great family of the Chinese nation”. With his stories about tradition and belonging, Mr Xi may just be on to something. 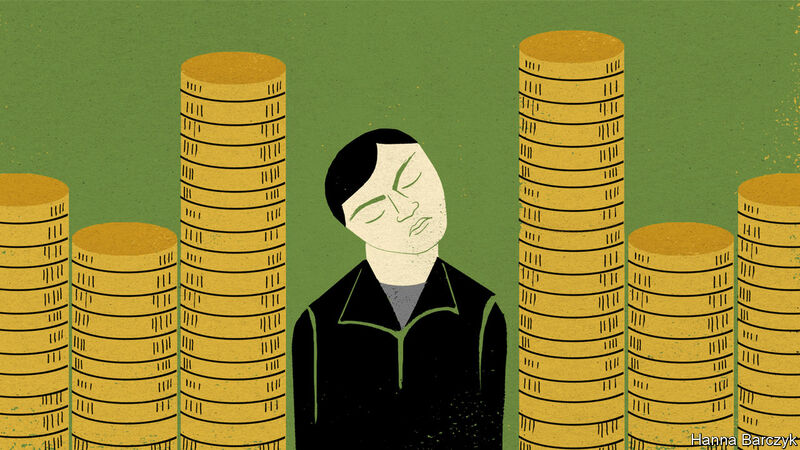 A happiness gap between rich and poor has narrowed as the lowest earners report greater well-being, to an extent that economic growth numbers alone do not explain. To stern Communist Party chiefs, few rights are inalienable. But the human need to be promised a good life? That is self-evident.